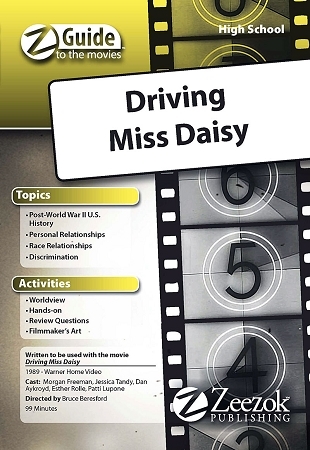 Zeezok Publishing's Z-Guide to Driving Miss Daisy is a great way to incorporate media into your study of the American Civil Rights History. This Z-Guide contains a topic overview movie synopsis and ten learning activities. Learn more about Dr. Martin Luther King Jr. and memorize a selection from his I Have A Dream Speech. Develop your writing skills by writing a help wanted ad and Hokes resume or perfect your artistic abilities by drawing one of the classic automobiles from that era. Evaluate your personal beliefs with the Worldview Activity probe the directors mind with The Filmmakers Art activity and get the entire family involved with the For Family Discussion section at the end of the guide. Note: popcorn is not included. Movie Summary: At her sons insistence a feisty Southern matron takes on an African-American chauffeur. Miss Daisy discovers that Hoke Colburn cannot read or writea problem she as a former schoolteacher soon rectifies. Unfortunately the prejudice they encounter elsewhere is not so easily overcome. This heartwarming film based on the off-Broadway play by the same name explores the broader topic of social inequality during the turbulent days of the civil rights movement. This Z-Guide is based on the movie Driving Miss Daisy (1989). You can view a trailer for the movie below.